MAKE EVERYDAY AN ADVENTURE, FROM CITY LIGHTS TO STARRY NIGHTS. A lighter, more economical truck than our Prospector HD Rams, Recruit features a base package of serious off-road components with several optional add-ons for even more capability. Recruit is AEV’s answer for thousands of Ram 1500 drivers who want to push their daily-driving truck farther off-road, expand the everyday versatility they expect from a pickup, and maintain a superb, smooth ride on pavement. We start with our DualSport SC Suspension, which lifts the truck four inches while retaining the nimble handling and towing/payload capabilities of the 1500’s excellent independent front suspension, and also allows for much larger wheels and tires. We add superior front-end protection with a stamped steel front bumper and skid plate, along with AEV’s performance-enhancing Heat Reduction Hood. The Recruit is your daily driver, built for extraordinary adventure. PREMIUM FRONT BUMPER: Made from 4 mm-thick stamped steel, designed for ultimate protection and utility. 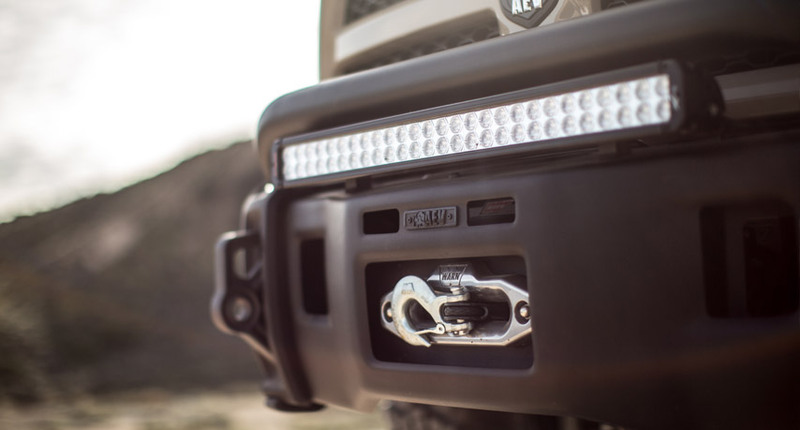 An optional 3/16” winch mount will support a 10,000 lb Warn Zeon 10-S winch, and heavy-duty aluminum tow loops further assist in recovery applications. Adaptive to multiple lighting configurations. HEAT REDUCTION HOOD WITH HD FRONT END CONVERSION: Unique vented design that allows fresh cool air to circulate over the engine in both static and dynamic conditions. While it provides aggressive styling, the Heat Reduction Hood is also a vital upgrade for heavy towing or traversing off-road terrains at low speeds. MESA WHEELS: Impressive form and function, capable of handling extremely heavy payloads. AEV’s signature valve stem recess provides added protection from rocks and other obstructions on the trail. A Protection Ring provides extra wheel protection when tackling off-road terrains. The 18 x 8.5-inch vehicle-specific wheel design provides the optimal balance of tire clearance, scrub radius, and handling. 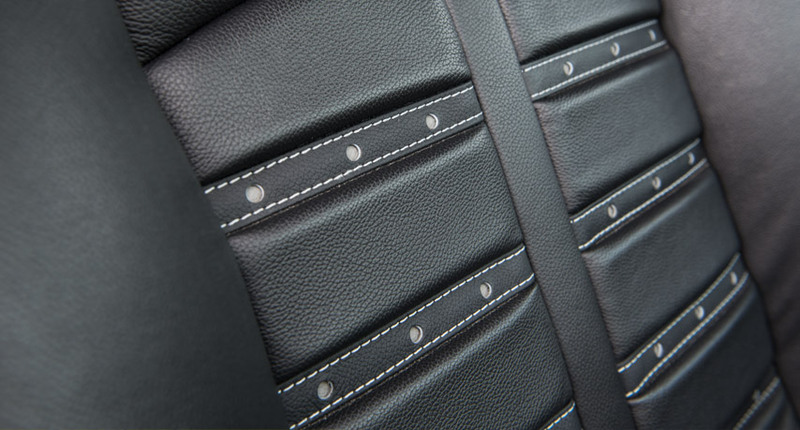 PREMIUM LEATHER UPGRADES: Choose between the AEV F-1 Leather Interior and AEV Standard Leather Interior. Both options feature perforated leather panels and AEV logo headrests that not only provide comfort, durability, and a highly stylized look. 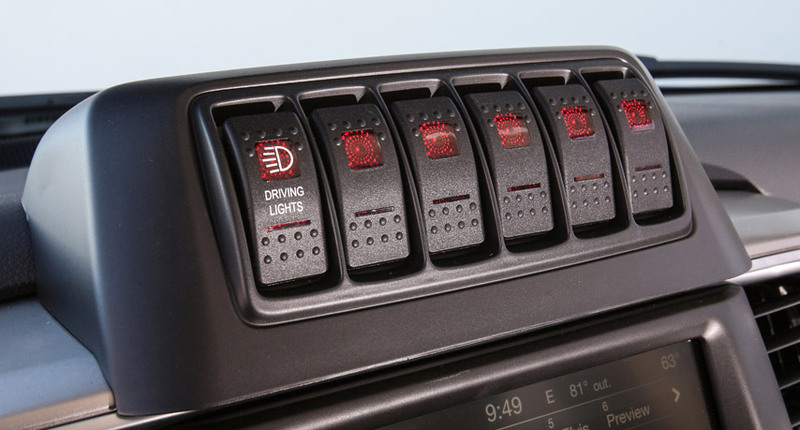 AEV SWITCH BEZEL: Custom AEV Switch Pod integrates flawlessly with Ram’s dashboard, allowing you to run multiple auxiliary switches. This clean integration allows you to control add-ons such as air-locking differentials, onboard air compressors, and off-road driving lights. DUALSPORT SUSPENSION: The ultimate in on and off-road performance. This is the most intelligently engineered and tested aftermarket suspension for 2013-17 Ram 1500 available anywhere. Ram 1500’s innovative Independent Front Suspension (IFS) delivers outstanding handling and control. AEV’s 4” DualSport Suspension System, a key component on Recruit, expands IFS capability off-road while maintaining excellent performance on pavement for daily driving. Lifting creates necessary clearance over obstacles and allows for the fitment of larger wheels and tires. The DualSport Suspension maintains balanced steering geometry for better handling and reduced driver fatigue in all driving conditions. Integrated components include A206 T4 aluminum steering knuckles, AEV-tuned Bilstein 5100 series shocks and adjustable struts. AEV’s innovative Pro-Cal Module is a user-friendly vehicle plug-in that seamlessly recalibrates multiple performance factors affected by the use of larger wheels and tires, including speedometer control, tire pressure monitoring (TPMS), and axle gear ratio changes. FRONT SKIDPLATE: Protection for Recruit’s front-end underbody is vital in extreme off-road driving. AEV’s massive skid plate is manufactured from 4mm thick stamped steel for two reasons: first, stamped steel is stronger than plate steel, and second, stamping ensures an exact fitment of the part over a large area for maximum ground clearance. 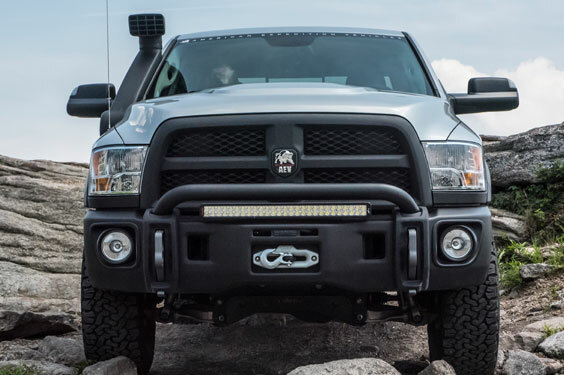 RECOVERY READY: Premium Front Bumper for Recruit easily adds an optional 3/16” winch mount that will accommodate up to a 10,000lb winch to assist with vehicle recovery. Standard heavy duty cast aluminum tow loops are rated to pass all OE load specifications and double as wear plates when sliding over steep obstacles. BED RACK: A durable steel, fully-mounted bed rack. This multi-purpose rack provides unlimited tie-down configurations for on-the-job and everyday hauling and is strong enough to support a camper, ladder, awning and other accessories for adventure travel. 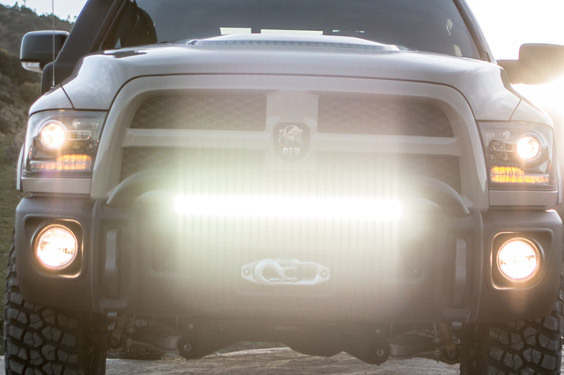 AUXILIARY LIGHTING: In darkness, foul weather, or difficult recovery operations you’ll be glad to have the Vision X Xmitter Prime LED Light Bar. This choice of the U.S. Border Patrol functions at extremes of both hot and cold temperatures. Also available: Vision X LED Light Cannons. RAISED AIR INTAKE: AEV’s Raised Air Intake provides Recruit’s engine with a clean air charge in a variety of difficult dusty or wet conditions. Available with either Air Ram intake or Cyclonic Pre-Filter. AEV components on your Recruit are proudly made in America and assembled in Michigan by highly-trained AEV technicians. 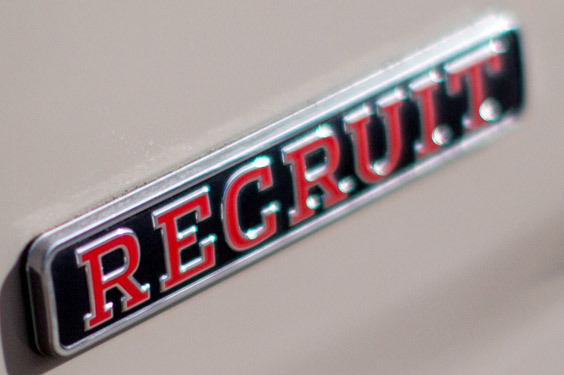 Every Recruit built receives a door-mounted AEV Build Plaque stating the vehicle’s serial number and build date. 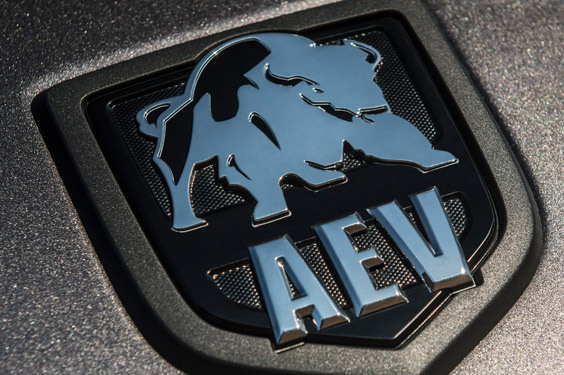 The AEV brand garners international respect as a leader in high-quality aftermarket components and vehicle builds. 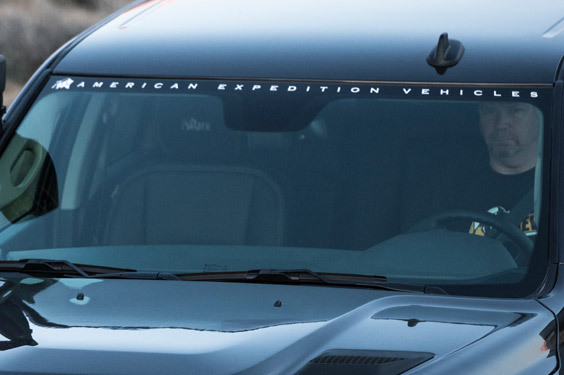 Vehicles built by AEV receive an exclusive branding package that includes a Windshield Decal, AEV Exterior Badging, Embroidered Headrests, and Custom Gauge Cluster Emblem. All AEV products, Recruit, and all other vehicle builds are covered under AEV’s Warranty. Warranty and financing inquiries can be made with your AEV Representative.